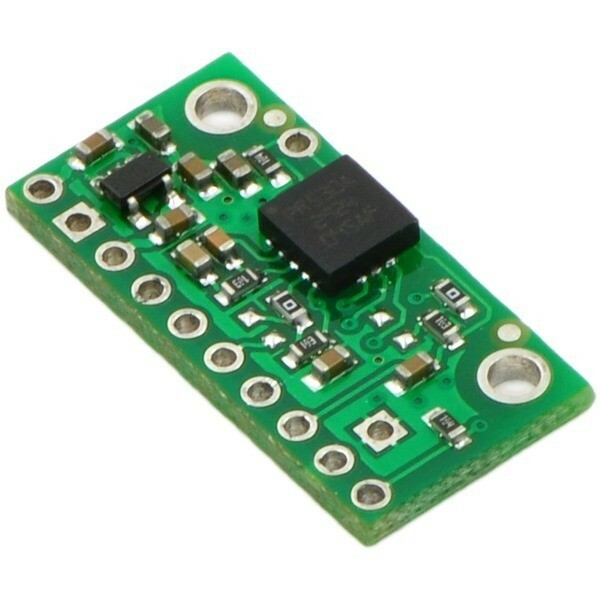 The product was replaced by the new LSM303D 3-axis digital Accelerometer + Magnetometer I2C/SPI. 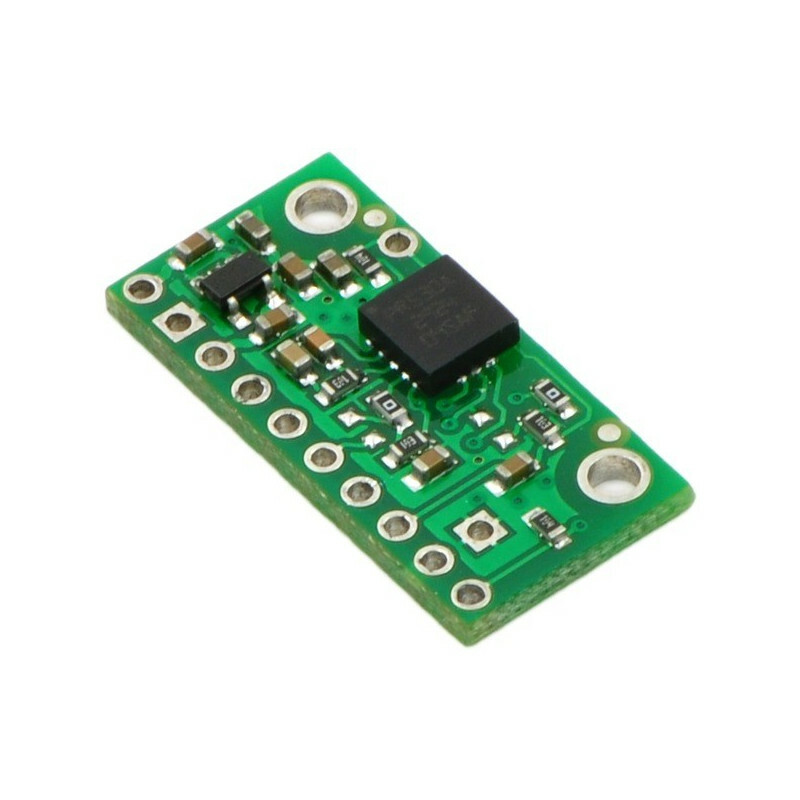 The sensor is used for measuring the angular velocity along two axes: X and Z. the Module is equipped with a gyroscope LPR550AL (datasheet) of the company ST together with the voltage regulator and the necessary passive elements. The output is passed to the Central unit in analog form. Conclusions are popular goldpin connectors, for connecting the sensor via wires or to connect directly attached to plate fixation. The system can operate, for example, using module Arduino , or set STM32Discovery. The sensor has ten insights for mounting goldpin connectors - 2.54 mm raster (included). 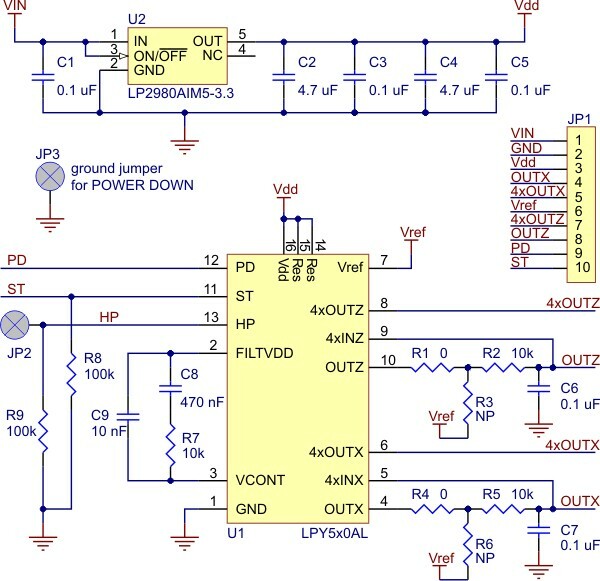 The voltage to 3.3 Volts and serves on the output of the Vdd/3.3 V. If it's higher, should be connected to VIN. 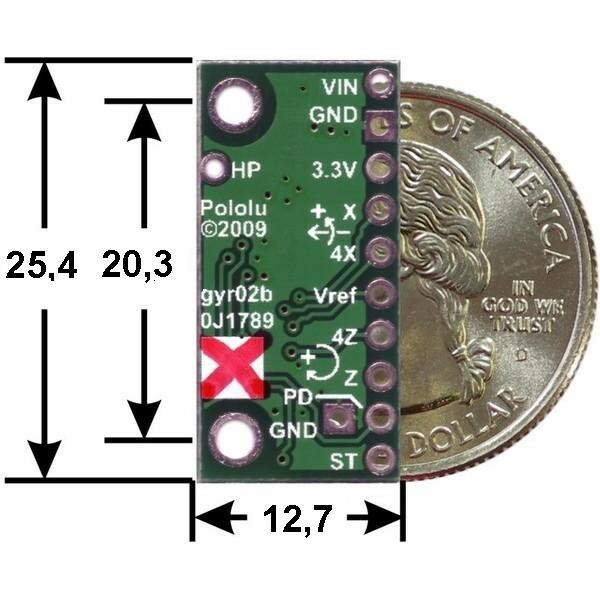 In this case pin Vdd/3.3 V can work as a reference output voltage of 3.3 V (max 50 mA), for example, the analog-digital Converter. Pin power-down is disabled by default. If sleep mode is not used, you must jumper to ground (photo nearby). 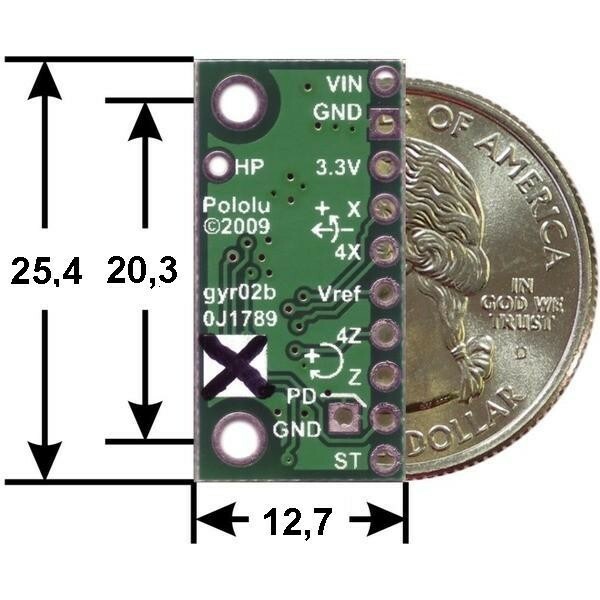 For the transition to a state of low energy level on pin power-down to indicate state is high (3.3 V). 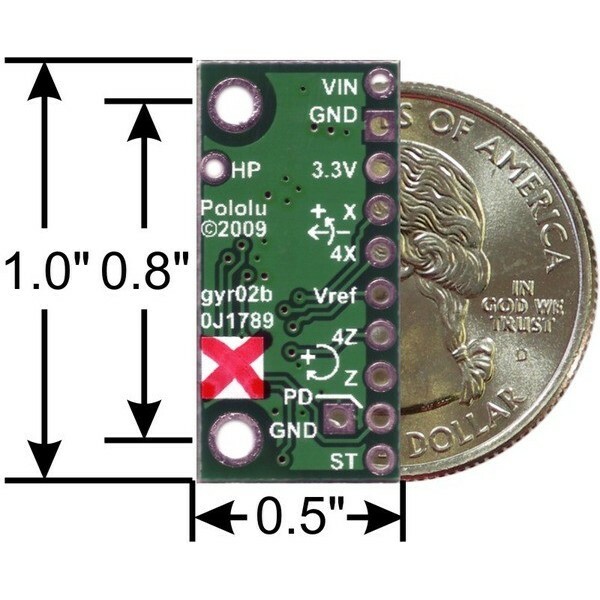 In systems powered from 5V, you can use the podciągającego resistor to 3.3 V.
Pin Self-test, by default, carry it to the masses. 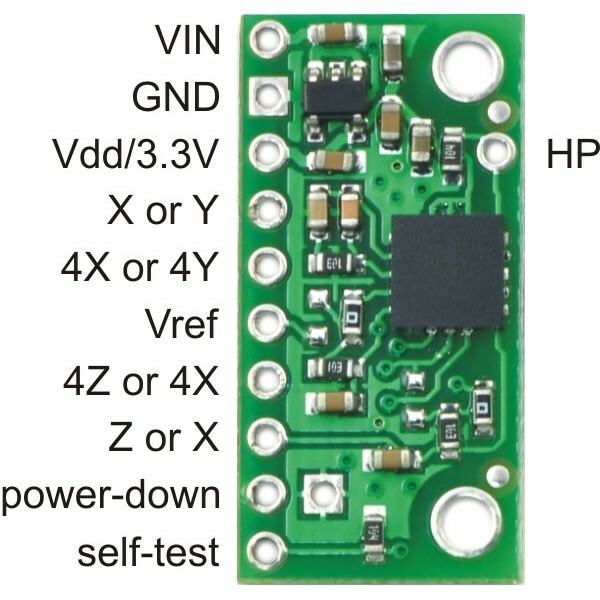 To use the self test option, you must specify the high state (3.3 V). The voltage reference. The output signal in the absence of motion is equal to the voltage Vref of the pine trees. Analog signals corresponding to acceleration values for each axis. 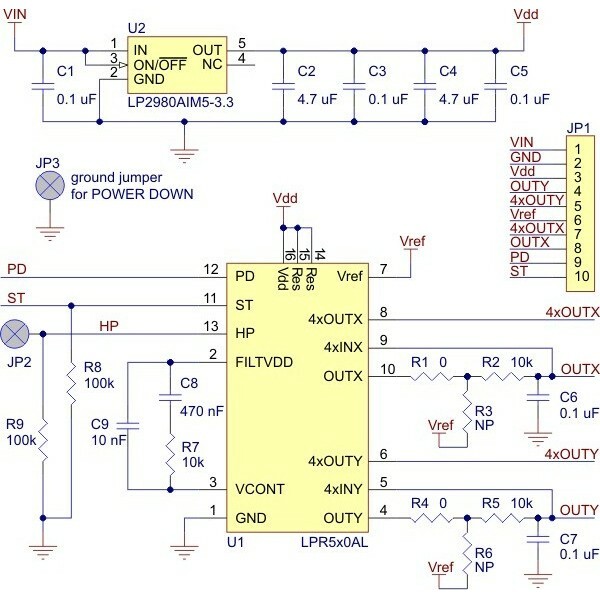 Figure 4 indicates that the signal is amplified four times. 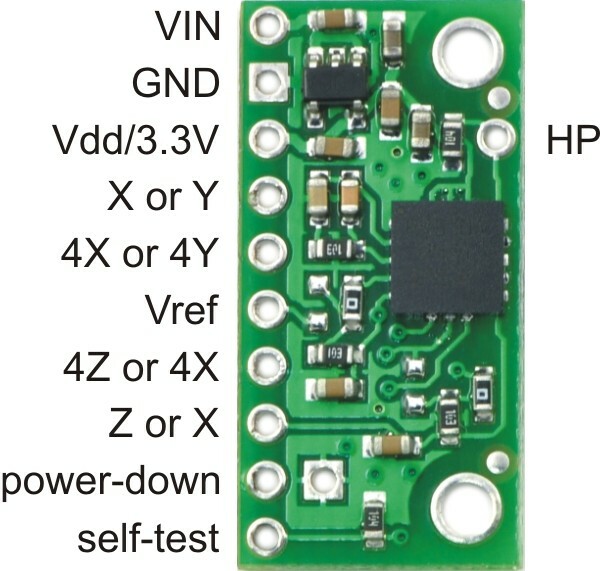 For entering power-down and self-test readings high to 3.3 V. Connect 5 Volts is not recommended and may damage the system.